January 1st, 2017 brings new home buying rules to the Real Estate industry. These new home buying stress test rules has pushed buyers to accelerate their buying timeline. "We suggested last month that some buyers may accelerate their purchase timeline to buy a new home in anticipation of the mortgage stress test on uninsured buyers - those with a down payment of 20 per cent or more - that will come into effect on January 1," says Victoria Real Estate Board President Ara Balabanian. In November 2017 there were 1,764 properties for sale (active listings) with an average selling price of $824, 600. That would be 10.2% increase over 2016. On record the VREB indicated that this is the highest number of home sales for November since 1996. 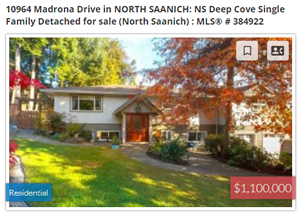 If you would like to learn more about your home preferences in the Victoria and Saanich Peninsula regions then please visit me at AnnWatley.com and try out my "Real Estate Search" feature. You can search homes by city, area, neighbourhood, postal code, or MLS#.